We’re delighted today to confirm that the public have again voted us the most welcoming theatre in Wales. Part of the annual UK Theatre Awards, Most Welcoming Theatre is an opportunity for audiences across the country to celebrate their local theatres. 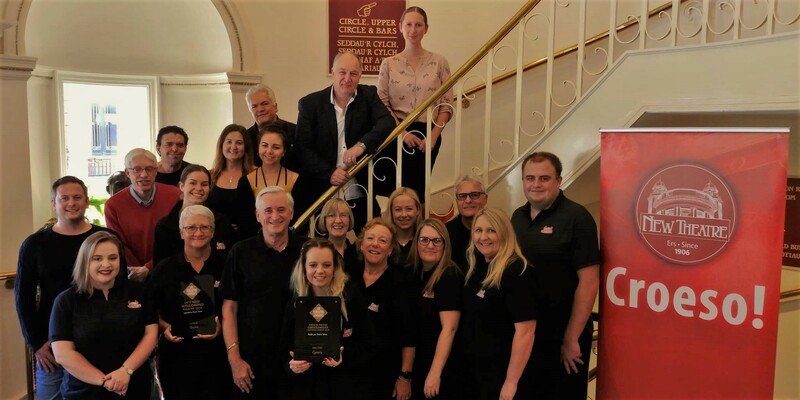 All the regional and national winners are now through to the UK Theatre Awards on Sunday 14th October at London’s Guildhall, where an overall UK winner will be announced. The New Theatre has just recently announced its packed line-up up for the next six months which includes stellar international performances including Murder For Two, the off-Broadway hit comedy musical; David Mamet’s Glengarry Glen Ross which comes direct from the West End; a return by the Royal Shakespeare Company after more than a decade with Romeo and Juliet, and Northern Ballet’s new biopic Victoria. Full details and tickets are available from the Box Office on (029) 2087 8889 and newtheatrecardiff.co.uk.